Slight deviation this week, but we’re still on the path to glory a setup of Adobe Analytics and Dynamic Tag Manager (DTM) that is as close to perfection as possible. The deviation today has to do with a question I was asked about a month ago: how can I track an attribute of a clicked element using an Event Based Rule? Remember: DTM is based on rules. You have rules that fire on page load and rules that can be executed when something happens on the page. The latter are called Event Based Rules and they are powerful for custom link tracking and for dynamic sites that use a lot of AJAX and DOM manipulation. 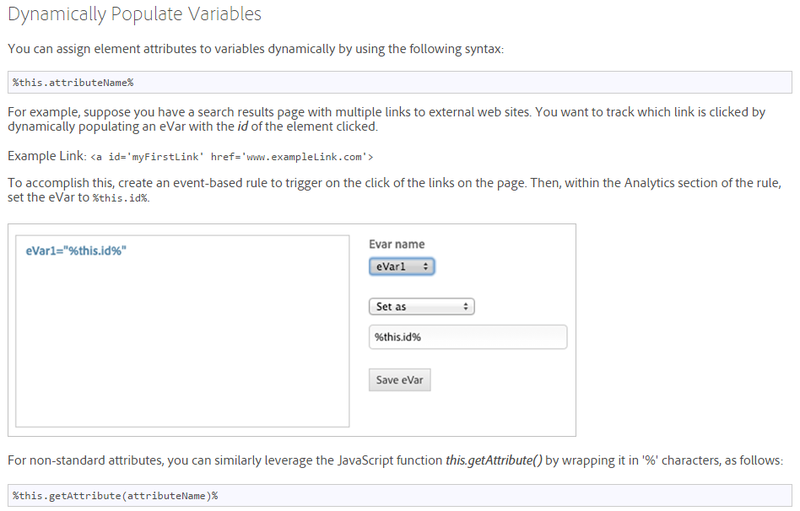 Event Based Rules, like all rules, allow you to set Adobe Analytics “variables”. You can use Data Elements for that, for example. This is great with a Data Layer, but I think I have mentioned that before. For the question above, the real puzzler was: how do you make a Data Element that refers to some attribute of the clicked element? And it turns out: you don’t have to! The example assigns the “id” of the clicked element to eVar1. I can assure you that “%this.id%” is not a Data Element that I built. This is built-in functionality. So I had to play around with that a little bit. Pretty cool, isn’t it?I haven’t tried to find out where the limits are. Neither have I tried to go beyond them. I hope someone else will, and I hope that someone will share their experiences and results! The quest for perfection will continue in 2015. For now, switch off your machines and brains. Have a good time off and a quiet time with your families! ‹ PreviousWhat does a Digital Analytics department do? Thanks for that link, Till, very helpful! I’m always amazed how many other blogs out there have interesting information and I don’t even know about them! Hey Jan, not even sure where to begin to google for this so I thought to ask you. Have you ever set more than one data element to a variable? just wondering if there is a catch to this? Not that I know of, no. Hi Jan, how about embedded youtube videos on a web page, which has a class surrounding it? Do iframes make this more difficult? iframes make everything more difficult indeed. Loading content in an iframe is almost the same, technically, as loading it in a different browser. If you really want to track your videos, it also makes sense to instrument the player, rather than using the embedded Youtube player. This is a piece of work, and it might not be worth it, depending on your site. Jan what would be the %this.####% value here if I’m wanting to grab the value between the . “If you are positive, if you want to help people, if you’ve got ideas then you can come and you can do it.” Find out what you could learn from a Raleigh expedition in this video from Tanzania. Not sure I understand your question. Which part do you need exactly? Congratulation for your blog, I’ve discovered it few days ago and I’m very happy to catch a new source of tech information about DTM. Concerning data element and event based rule, we can consider that we don’t have to use data element but it is better in a lot of cases for factorization purposes. The challenge is to workaround the fact that DTM data element doesn’t manage “Click Element” and you have to do the job differently (contrary du GTM as example). To factorize attributes scrapping, I transmit my clicked element from the rule to the data element using parametered signature. That, Mehdi, is insane and genius, and I am in awe! … not to forget beautiful, and practical beyond belief! Merci, Mehdi, pour cet astuce brilliant!